I am by no means a ‘techie’ as Christopher calls himself, but a quick look round my house reveals a quite astounding history. In various cupboards I find an HP desktop computer from about 10 years ago, very rarely if ever used, another obsolete Hitachi desktop from 15 years ago, my last Chinese laptop (the lid broke off), an IBM Thinkpad, an HP laptop, an old Vaio and even an Ollivetti laptop from 20 years ago. I have never thrown them out for various reasons, one being security, another being that one day I might need my undergraduate dissertation for something and the third being that I want to know what happens to them when they are taken away. Recently I have learned that all is not quite what it seems with recycling of computers too, and this makes my quandary all the more difficult. 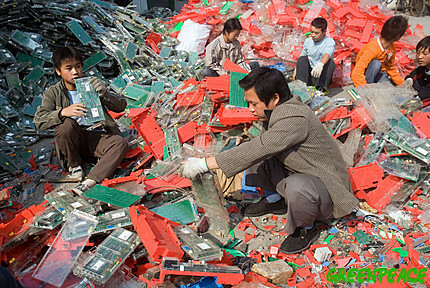 Chinese workers take apart electronic trash on the street in Guiyu, China. Several companies offer to recycle your old computer for you, and an enormous industry has grown up around the trade in old technology. In China entire cities have been born that specialize in taking our old stuff, but I feel that recycling is a bit of a big word to use for the ensuing process, as it has positive connotations. The computers are dismantled and all of the re usable pieces taken away, then the rest is dumped in a large pile. People from the surrounding areas scratch a living by doing a bit of home made scavenging, be that boiling components on their cooker at home or dipping cables in acid baths to extract the tiny bits of semi precious metals that they contain. Obviously this is done without regulation, and the results are often poisoning for those involved and the surrounding areas. See this photo essay about the city of Guiyu pictured above, probably the largest e-dumping ground on Earth today, and where a large portion of the products in question end up. Another possibility is that the computers are shipped as donations to the Third World. These donations come in containers, not packaged in cardboard however but just thrown in, so although some do work, the majority don’t. The recipients have to unload them and try each one to see if it is usable. Those that don’t have to be dumped, and can be found piled up in heaps or abandoned by the roadside outside the larger African Cities, again to poison the ground etc. This video from Ghana goes into greater detail. India has some recycling sites and used to import waste for processing but now the problem is that the country itself is now a major producer of waste as it becomes one of the most technology saturated countries on the planet. And India is not alone, consumer societies all over the ex developing world are hungry for new technology, and obsolescence is just round the corner. This short article in Time expands upon the argument. Large sums of money are involved as we would imagine, but the industry is practically non-regulated in real terms. Government regulation does exist but with the majority of the work carried out in the informal economy it is not adhered to, and dirty job as it may be it provides income for hundreds of thousands of poor migrant labourers. And we are speaking about a problem that can only get worse. I personally don’t think it has to or should be like this however, it is not fair and it is exploitation, and so my question is ‘what can be done about it?’ Or more correctly ‘what can we do about it?’ We are the guilty party after all. Until the day comes we have computers that don’t need updating, we have a problem. Companies must keep making new models, pushing innovation forward and “selling us the dream” to stay in business. A viscous cycle. Software companies will continue pushing the boundaries of what’s possible as well, further increasing the need for faster hardware. We can never be satisfied unfortunately. Yes, and a related problem is that formats become obsolete. One of my friends could not open a file on floppy disk that contained her PhD thesis last year because she could not find a computer that read it (some kind of WordPerfect file). Fortunately in my collection I had just the machine (with floppy portal) but many documents must be lost due to this problem. I have a digital video camera that is only 5 years old but I can’t use it because the only way to get the images out is by Firewire, and new computers don’t have Firewire sockets any more. Well, I think many countries are still unaware about this issue. We have to create a technology and better process where recycling of electronic products can be done easily and without harming our environment and lives of people. Though I personally feel, Government are too lazy and would take step when this problem become more dangerous like Global warming. I agree, but waste management is a notoriously dirty and backhanded affair. Centralization and regulation will not be an easy road. This is a growing concern for many these days I saw an expose on one in china a few years back.